Ohhhhh those books. The Black Stallion's Filly was probably my favorite! I wonder if I could get my hands on most of these through my local library — I probably own half of them packed away in boxes lol. My husband recently teased me about still owning some of these. I'm gonna have to check my collection. Did you ever watch the tv show? I used to catch it before school when I was a kid. YES, Black Minx! With the hot potato! That might be my favorite too, according to my hazy memory. I never did watch the tv show – I might take it on as an additional summer project. My gut tells me it will be bad. Do you think it will hold up? Oh man, I haven't re-read these since I was a teenager! I have a lot of them, but they aren't in the best shape – not sure they could handle a re-read! 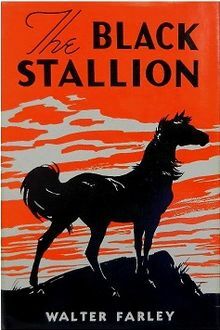 I think as a kid I love the Island Stallion a lot. I also used to “breeze” my appy/welsh pony up and down the cornfields…lol! I haven't read these since I was a kid. I always like the Marguerite Henry books better, but I remember liking these a lot as well. I look forward to following along. I definitely haven't read these in a very long time! I look forward to your posts and might have to join in!